You never know what you're going to see when you visit a world for the first time—particularly when it's on the solar system's most distant frontier – but you can get ready to see it. 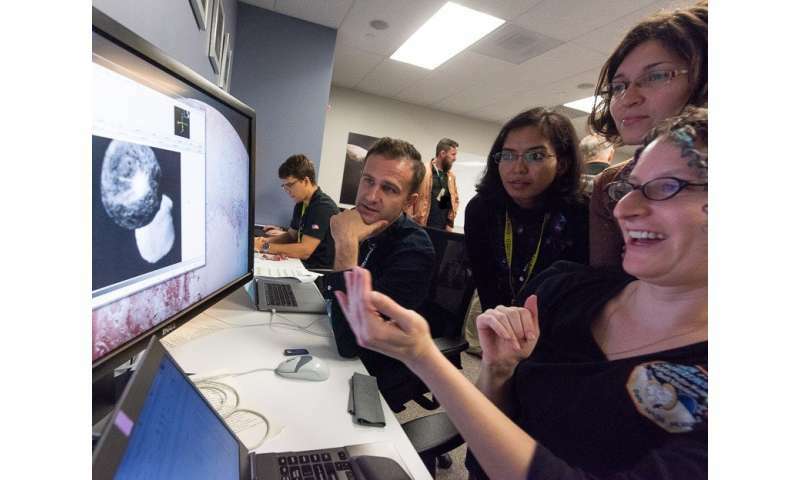 NASA's New Horizons science team recently wrapped up a three-day rehearsal of the busiest days around the mission's Dec. 31- Jan. 1 flyby of Ultima Thule, a Kuiper Belt object orbiting a billion miles beyond Pluto. Working with the same software tools, and in the same space they'll use during the actual flyby the Johns Hopkins Applied Physics Lab in Maryland, more than 50 scientists downloaded and analyzed simulated data and worked with the mission's communications team to "announce" these discoveries through practice news releases and media briefings. The activity was among the last of almost two-dozen operational readiness tests – known as ORTs – the New Horizons team has conducted to cover critical aspects of its upcoming flyby, from spacecraft operations and navigation to searches for rings, moons and other potential hazards around New Horizons' target object. The team held several similar tests leading up to the historic flyby of Pluto in July 2015. "This was our science team's final exam," said Principal Investigator Alan Stern, of the Southwest Research Institute in Boulder, Colorado. "and they passed it with flying colors—meaning we're ready for the Ultima flyby coming almost exactly 100 days from now." For this science-communications ORT, held Sept. 6-8, Stern tapped members of the science team to craft realistic mockups of imager, compositional spectra, and other datasets. Working for weeks before the ORT, the data creators came up with a complex, simulated Ultima sporting multiple objects surrounded by a thin ring. The scenario wasn't so far-fetched, given that initial data gathered on Ultima (officially named 2014 MU69) indicates it might actually be two objects, known as a binary, with both segments either touching or orbiting close to each other. "New Horizons is already conducting humankind's first-ever close flyby of a small Kuiper Belt object, an incredible feat by itself," said Project Scientist Hal Weaver of APL. "But If the real Ultima is half as cool as the one we simulated in this test, we're in for an even more amazing start to 2019."